PRODUCT DESCRIPTION: This is the top of the line when it comes to dusters. Made of brass and stainless steel this is a durable piece of equipment. Put dust in the stainless steel tank, and pump it up. 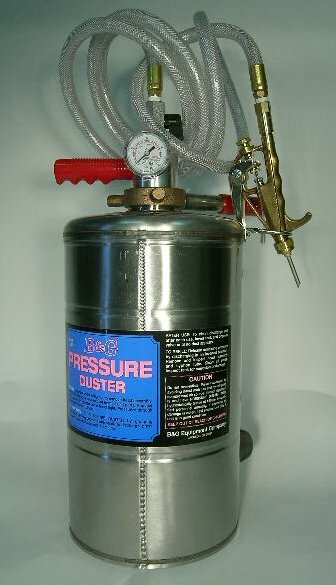 This will hold a couple of pounds of dust and can be pressurized up to 150 psi! No other duster will put out this much dust so fast! It also has been modified in the past by using an extension pole for reaching up 15 feet or more using PVC piping. This duster is very versatile and is a must have when doing European Hornet work. It is also useful for everything else, and is a great investment. 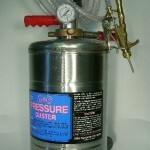 Pressurize the tank with a portable pump and you are ready to rumble. Fields marked by an asterisk (*) are required. Discount is based on total of order.